notices another being here, I just say, “Oh she’s been here for days; didn’t you notice?” So, why foster? Sometimes a pet, especially an ownersurrender gets very stressed in a shelter. They may have an injury or litter on the way, and need ‘round the clock care. Some pets become homeless when the owner passes away (illness, tragedy, elderly). Maybe they made no plans for their beloved pet’s care, and no family member is willing to take them in. Do YOU have a written, discussed and agreed-to plan, for your pets? Displaced pets find themselves suddenly separated from the comfort of their homes, consistency of a schedule and the love of the only family they have ever known, to a lonely kennel or crate—not by choice. A calm home environment will help the pet acclimate to changes while the foster family gathers information, traits, likes and dislikes and behavior to find the best new home for them. Many shelters, humane societies, and rescues have a program and/or training for prospective foster families. Are you truly ready for a full time, possibly 10-15 year addition to your family? Fostering can help you decide while you assist the shelter in opening space f o r o t h e r displaced pets. Typical fosters can last from two weeks to a few months. Sometimes, foster families become FCFs, f o s t e r c a r e failures. While fostering, it is best to err on the side of caution, especially during those first two to three weeks, “the honeymoon”. Crate or confine the dog when you are not around to supervise. Leave classical music on to keep the animal calm. Keep notes of their likes, dislikes, and behavior. Always have the collar with ID tags on. NEVER allow the dog off-lead in an open area. Work along with the shelter/rescue in promoting the pet for adoption. Take them to pet-friendly events with an “Adopt Me” bandanna or vest on. Post pictures and updates to social media. If you have an existing pet in the house, ask for their help (yes, I am serious). Give your pet lots of extra attention and love. Be vigilant at feeding and training times. A certain foster I know, is BEYOND foodaggressive. She will challenge anyone to a duel, over a crumb. She is served last and dines in her crate, to avoid issues. have nursed the foster through an injury, pregnancy, heartworm treatment or sudden loss of its family. You opened the next chapter of their happy life, moving forward. I think of all my fosters often. I look through pictures and recall fun times and outings we shared. I am grateful to my aussie pack for the understanding, help and nurturing they provide. If you have an adopted pet, let the organization know how the pet is doing. We LOVE photos, too. So, you ready to foster? It’s a valuable asset in rescue, and wonderful way to open your home and heart to an animal in need. 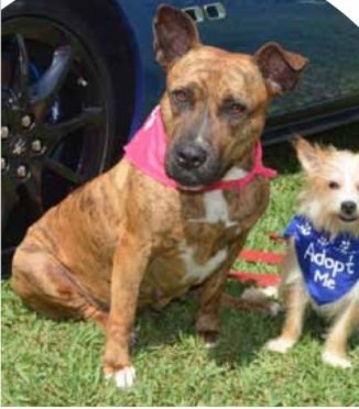 Jill (sweet pit mix) and Jack (terrier mix) were found together, as strays in Miami. Both about four years old, they are a bonded pair. Sadly, they just had their one-year anniversary at Big Dog Ranch Rescue in Wellington. They are great with other dogs and kids, quiet and loving. While they love serving as ambassadogs, at the BDRR offices, they really want a furever home, together. www.BDRR.org. Photo courtesy of Tina Valant.